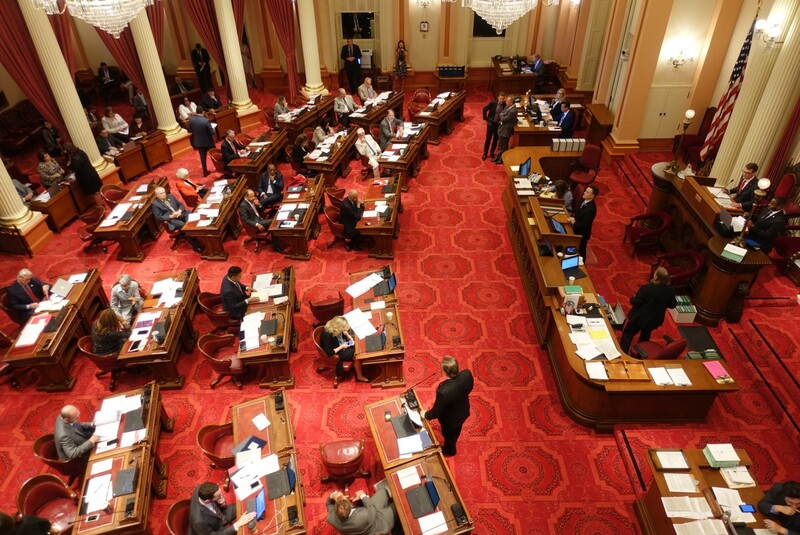 The California Senate in session in Sacramento. The 2,650-mile-long PCT extends 1,692 miles through some of the most beautiful and wild parts of California, including five California state parks, as well as national forests, national parks, national wilderness areas, national monuments and private properties. 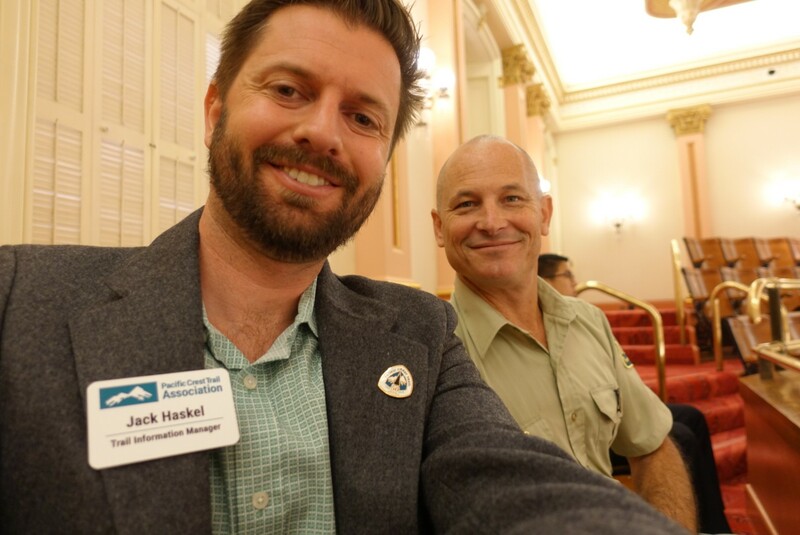 Gregory Connick, the Acting Region 5 partnership liaison for the U.S. Forest Service, and Jack Haskel, the PCTA’s trail information manager, sat in the gallery during the Senate session and were recognized by Sen. Hertzberg from the floor. Jack Haskel and Gregory Connick. We are nearing the Oct. 2 anniversary of the National Trails System Act. On that day in 1968, President Lyndon Johnson signed the legislation, a groundbreaking law that created our national trails system and designated the Pacific Crest and Appalachian trails as the country’s first two National Scenic Trails. Today, there are 11 National Scenic and 19 National Historic trails. WHEREAS, The management and protection of the trail is the responsibility of a partnership between the United States Forest Service and the Pacific Crest Trail Association, along with many other federal, state, and local agencies, and countless volunteers devoted to maintaining and managing the trail for all to enjoy a closeness with nature; now, therefore, be it resolved by the Senate of the State of California, that the Senate recognizes 2018 as the 50th anniversary of the designation of the Pacific Crest Trail as a National Scenic Trail and urges all involved to continue to protect and preserve this world-renowned trail for the continued use and enjoyment of the public. Sen. John Moorlach spoke in support of the resolution. He talked passionately about his time hiking sections of the PCT in Southern California and why the PCT was important to him. Each of the 11 California State Senators that have the PCT in their districts introduced the resolution. 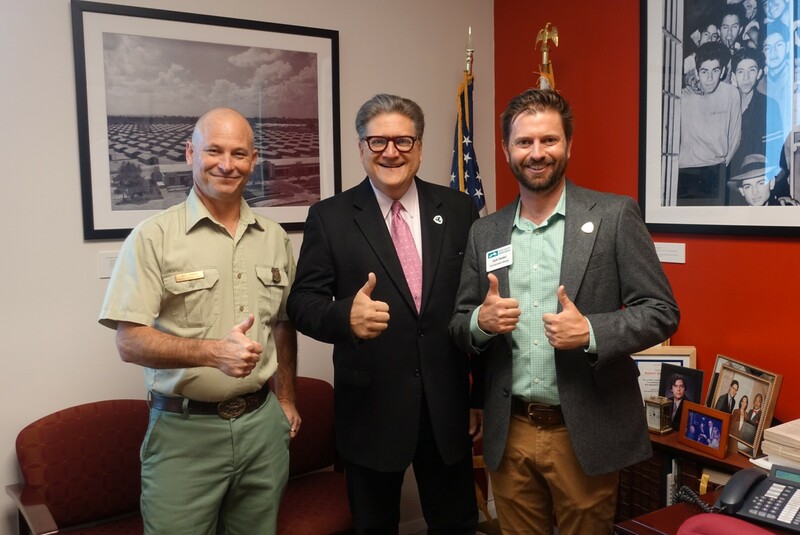 The PCTA wishes to publicly thank Sen. Hertzberg and the other PCT senators for their recognition and support. They are Senators Joel Anderson, Tom Berryhill, Jean Fuller, Ted Gaines, Ben Hueso, Mike McGuire, Mike Morrell, Jim Nielsen, Anthony Portantino, Jeff Stone, and Scott Wilk.